Take a deep breath, gang, and join NG Kids as we learn ten fab facts about one seriously splash-tastic sea creature – in our bottlenose dolphin facts! 1) Bottlenose dolphins are marine mammals that live in tropical and temperate oceans (oceans with mild temperatures) around the world. This includes the waters off the UK and Ireland, where you can spot them swimming and playing in bays and river estuaries! 2) These beautiful creatures have a short thick beak (as their name suggests!) and a curved mouth, giving the appearance that they are always smiling. They are usually grey in colour, and measure around two to four metres in length. 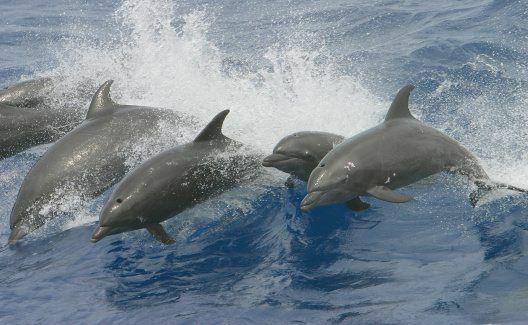 3) Social creatures, bottlenose dolphins travel in groups, called “pods“, of around 10-15. In these groups they play and hunt together, as well as cooperate to raise young dolphin calves and help each other. 4) Bottlenose dolphins are super swimmers, gliding through the water using their curved dorsal fin on their back, a powerful tail and pointed flippers. They can reach speeds over 30km an hour and dive as deep as 250m below the surface! 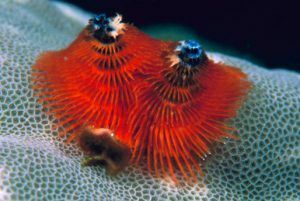 5) These cool creatures are awesome acrobats, too, and can be seen flipping (or “breaching“) out of the water. 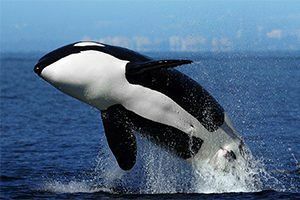 In fact, they can launch themselves up to five meters out of the water before crashing back down with a splash! There are different theories as to why they do this – it could be to get a better view of things in the distance, clean parasites off their bodies, communicate with other pods or just for good fun! 6) Although they live underwater, the bottlenose dolphin must come up to the surface to breath air. It breathes through what”s called a “blowhole“, a hole at the top of its head. These clever creatures can open this hole when inhaling and exhaling out of the water, and close it when below the ocean surface. They can hold their breath underwater for around seven minutes. 7) Bottlenose dolphins are kings of communication! They send each other messages in different ways – they squeak and whistle and also use body language, leaping out of the water, snapping their jaws and even butting heads! 8) These magnificent mammals also produce high-pitched clicks to help them navigate and find food – a process called “echolocation“. When the clicking sounds hit an object in the water – such as a rock or fish – they bounce back to the dolphin as echoes. From this, the super swimmers can work out the location, size and shape of the object. Cool, eh? 9) Carnivores, our finned friends eat mostly fish, but will also eat crustaceans such as shrimp and squid, too. 10) Thankfully, bottlenose dolphins are not classed as endangered. However, illegal hunting, fishing nets and pollution pose threats to these incredible creatures. 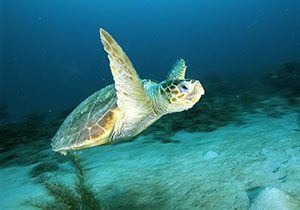 Love reading about sea life? Then be sure to check out our Humpback whale facts! Dolphins are my favourite animal these facts were really interesting. WOW!!!! Awesome dolphins . I really LOVE reading about the dolphins . 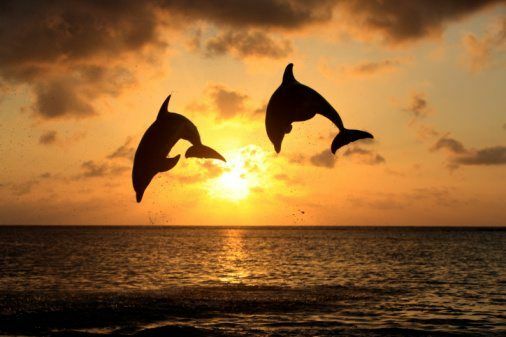 # I LOVE DOLPHINS!!!! dolphins mum and dad baby is 1. I love dolphins so much. I love dolphins i did a report on them. OMG Dolphins are my favourite animals... 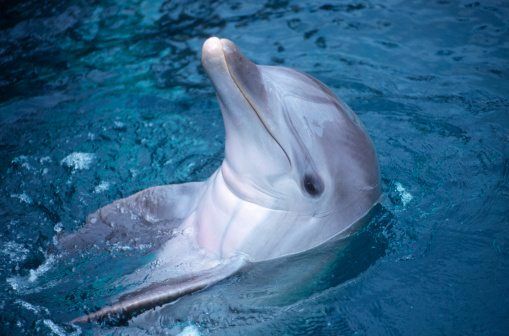 Please guys I've got a dolphin Idol called winter who lives in florida.. See her on webcams at Seewinter.com. Did you know Dolphins only partly sleep so they can get to the surface for air? I think a dolphin should be a man's best friend instead of a dog. Excellent facts and helped me with my homework! It's amazing that they can dive 250m! 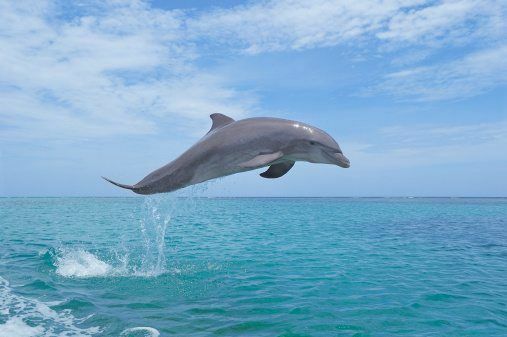 It is so amazing how the Bottlenose dolphins are super swimmers and they can reach speed over 30 km an hour. the dolphins are so cute!!!! and veryyyyy beautiful!!! This is cool. This information is very interesting. 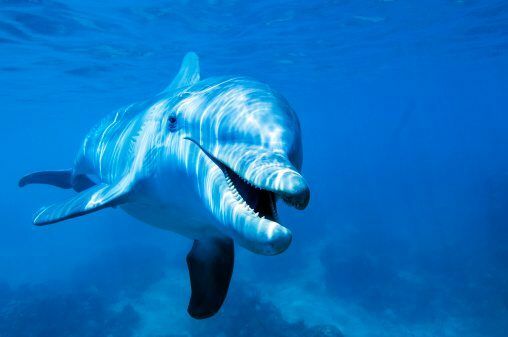 I like dolphins, they are good animals and this information is very complete. Thanks! awesome facts about the dolphins.the dolphines are so cute and very beautiful!!! Dolphins are so cute. Good facts about dolphins. I love this website it has all the pros but I would really like a video to give me more info... Thank you for all the facts but that video would hook me on to the site. Im going to go read more, bye! Thank You National Geographic for helping me on my project!Thank You a million!!!! i love bottle nose dolphins!!!! these are great facts about bottle nose dolphins. im using this for a projet thx ! Cool! Im using this info for a project and I got an A*!!!! So good!!!!!!!! Dolphins are so cute and very smart. You Will Now Experience Some Seriously Bad Dajavu MWHAHAHAHAHAHAHA! I Have Met You Before! TROLOL! 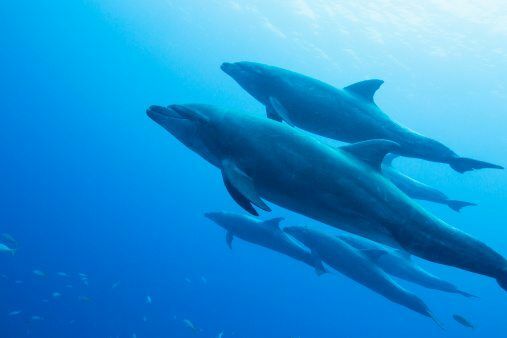 Bottlenose Dolphins are my favorite animals that live in the sea! Never heard of them before but they seem very cool and unique !! SMACKADOO!! I just dropped my toasty warm waffles thinking about these dolphins, crikey these are some mind boggling facts arent they!!! Please have an article with more facts. Although this was a little helpful. Dolphins can really rule anything anytime. So long all other underwater Creatures!!! Please people talk more about Dolphins. And dolphins, be more awesome!!! Be awesome some more Dolphins! I think dolphins are great because of what I have learned! I am writing about dolphins in school and this really helped me! How did u manage to take those photos? this really helped me on my research paper for fifth grade. i got a perfect A+! Thanks for all the info. Really helped me on my project!!!!!! Thank you so much for all of this wonderful information! It has helped me so much on my current reseach report for 8th grade! i love this website because it helps me on my reasearch. I love dolphins there the best. Thanks for the facts. thanks for these facts !!! Ive always wanted to learn about dolphins!!!!!!!!!!!! dolphins are awesome and i want one as a companion for life!!!!!!!!!! !can someone get me one please STAT! I love dolphins they are so cute! Cool. So thats where they get there name from. Dolphins are my favourite wild animals! I love baby bottle nose dolphins! Dolphin are super cute and very adorable beings I wish I could swim with them. They could be my pets. THEY ARE SO CUTE ! ! ! ! I love dolphins so much! They are sooo cute! Cool sure I will check out your humpback whale song and facts ! 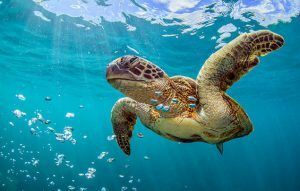 How much do you know about these beautiful sea creatures?